Millions all over the world have felt the devastating effects of the earth’s degradation – increased occurrences of flash floods, super typhoons, severe drought, tornado outbreaks, and more. The earth is no longer the safe, beautiful, and nurturing home that it used to be because man simply kept on taking but failed to give back to Mother Nature. Sonshine Philippines Movement (SPM) together with concerned institutions, companies, organizations, and communities, is launching the “EarthFest 2012 and The Environmental Hero Awards” on November 18, 2012 at Filinvest Corporate City, Alabang. This grand sports event with the theme “Sports War Against Climate Change” aims to raise funds for SPM’s environmental programs and advocacies nationwide. SPM is a multi-awarded non-profit organization who continues to advocate positive change by empowering the youth and different community sectors to care for the environment. We actively implement nationwide clean-up drives, tree planting activities, recycling campaigns, marine resources development, environmental awareness and similar programs. Prizes await the winners! Plus gadgets and souvenir items will be given away! Awards will also be given to the largest delegations. Now is the perfect time to heed Mother Nature’s call! Be an environmental hero! Support Sonshine Philippines Movement and help us work towards the restoration of the earth by participating in the “EarthFest 2012 and The Environmental Hero Awards”. 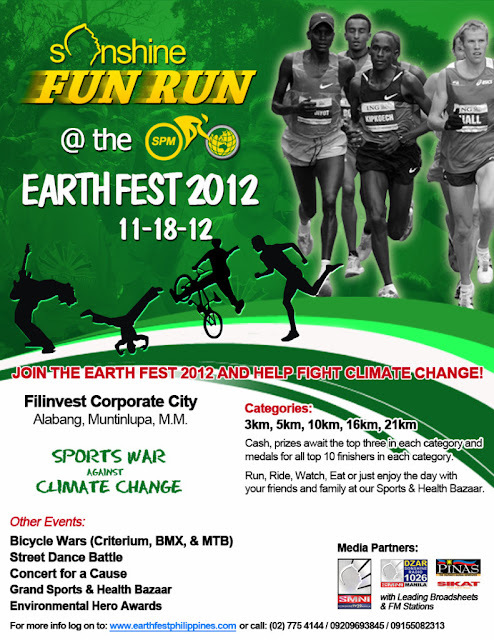 Reserve your spot and log on to our website atwww.earthfestphilippines.com. You may also call us at (02) 775 4144 / (02) 453 0589 or text us at 0915 508 2313 / 0915 810 9027 / 0920 969 3845. Discounted registration fees are given to early registrants.